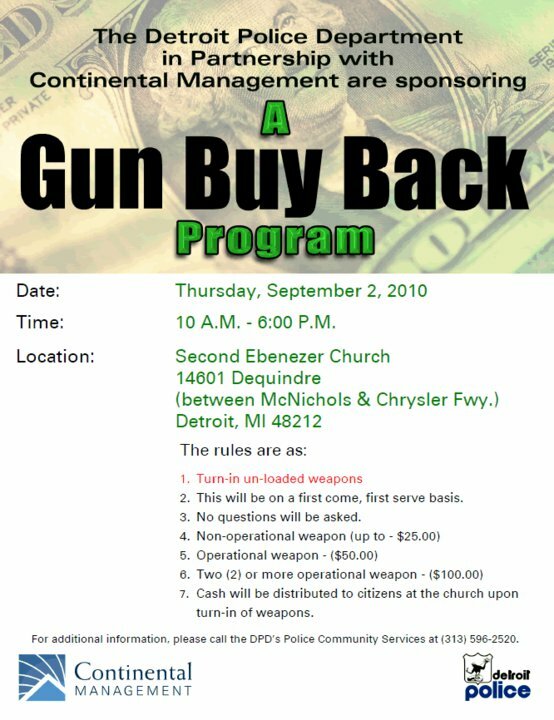 The Detroit Police Department is launching a gun buy back program, in the partnership with Continental Management, on Thursday, September 2 from 10 a.m. until 6 p.m. This will happen at the Second Ebenezer Church (14601 Dequindre), which is approximately five miles away from the Warrendale neighborhood. Anyone may turn in an un-loaded weapon. The police will buy operating guns for $50 each. Non-operating ones will be bought for $25 each. Individuals will be paid in cash with no questions asked. This is a very effective way of getting illegal guns off the streets. the money and try to find a better gun than they had. helping the area one bit. what happened to the ATM machines at the chase bank? You asked a lot in this post. Therefore, I'll respond to all this in a separate blog post above.